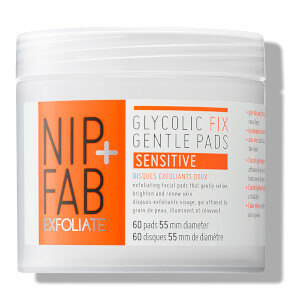 NIP + FAB Glycolic Fix Daily Cleansing Pads – 60 st.
Refresh and refine your complexion with NIP+FAB Glycolic Fix Daily Cleansing Pads, a supply of exfoliating facial pads to leave skin with a soft, smooth and brighter-looking appearance. 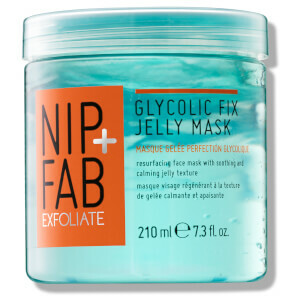 Infused with a cocktail of exfoliating Glycolic Acid (2.8%) and Witch Hazel, the resurfacing pads gently slough away dead skin cells whilst toning to promote a smooth, radiant-looking visage. Deeply cleansing and moisturising, the re-texturising pads also contain a blend of Hyaluronic Acid and calming Blue Daisy for plump, moisturised results. Expect smoother, renewed and younger-looking skin. Torka med rondellen över ansikte, hals och dekolletage. Applicera på rengjord hud en eller två gånger dagligen. Undvik överdriven solexponering och kontakt med ögonområdet. Om du får produkten i ögonen, skölj rikligt med ljummet vatten. Applicering av solskyddsfaktor efter användning rekommenderas. 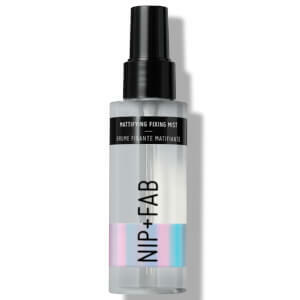 Aqua (Water), Glycerin, Glycolic Acid, Polysorbate 20, Sodium Hydroxide, PEG-12 Dimethicone, Hamamelis Virginiana (Witch Hazel) Water, Phenoxyethanol, Benzyl Alcohol, Alcohol Denat. (SD Alcohol 40-B), Disodium EDTA, Globularia Alypum (Blue Daisy) Extract, Panthenol, Lactic Acid, Parfum, Limonene, Ethylhexylglycerin, Dehydroacetic Acid, Sodium Hyaluronate, Linalool, Geraniol, Citral. 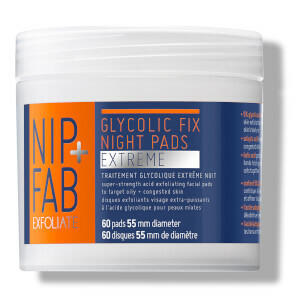 NIP + FAB Glycolic Fix Extreme Night Pads – 60 st.